A group of dedicated volunteers help GALT in the West Texas area. Based in Amarillo, these volunteers focus on fostering greyhounds that are on the Injured Reserve list and need long-term care. Greyhounds being treated for tick diseases, injuries or heartworms might be fostered in West Texas until they are healed and can be moved to the Available for Adoption list. These volunteers also assist by helping to transport greyhounds. West Texas-area GALT volunteers show off their greyhounds at events throughout West Texas and welcome anyone who wants to meet a greyhound or bring a greyhound to join them. 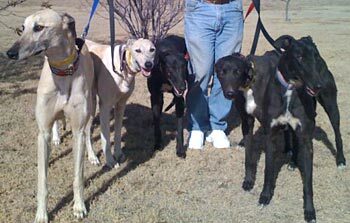 If you are in West Texas and are interested in getting to know more about greyhounds, we can arrange to talk with you and introduce you to our Amarillo-based greys. Contact area coordinators Marian and Lonnie Jones via email. GALT's West Texas representatives will be waiting for you! Come by to meet some greyhounds and learn more about this elegant breed!